Tony La Russa is usually praised (and occasionally mocked) for the way he deploys relief pitchers. No other manager loves to mix and match pitchers and hitters, while making double switches (even in the 3rd inning). Depending on the fan, La Russa is either a tactical genius or a human rain delay. 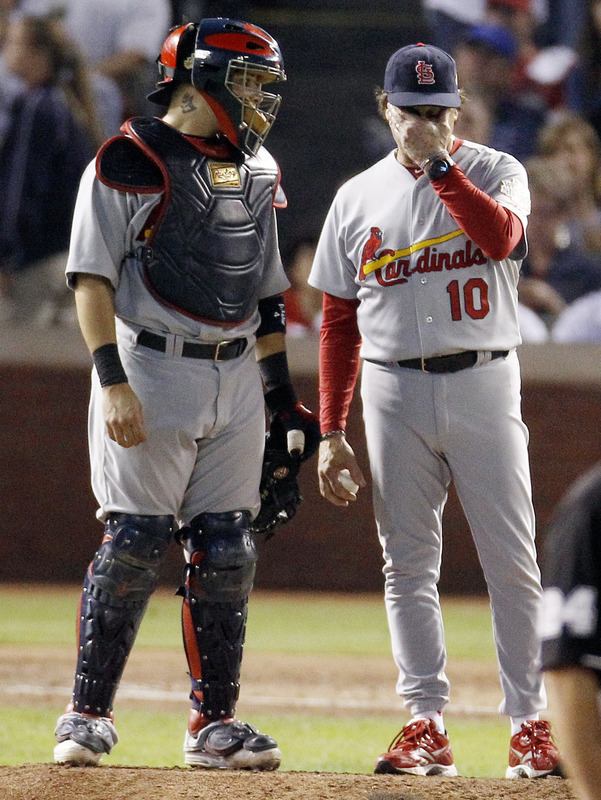 But on Monday night in Texas, the St. Louis manager and his coveted bullpen had a failure to communicate - literally. In the 8th inning and with the game tied, La Russa wanted left-handed reliever Mark Rzepczynski and right-handed closer Jason Motte to get loose. But bullpen coach Derek Lilliquist didn't get the message - allegedly because the bullpen phone was drowned out by all the noisy fans. The result? Only Rzepczynski was available and the lefty specialist gave up a pivotal two-run double to right-handed slugger Mike Napoli. "That phone in a loud ballpark, it's not an unusual problem," La Russa said. "I mean, it doesn't make it right, but ... Maybe we need to come up with some ear mikes or something." La Russa said a similar phone fiasco happened as recently as the NLDS in Philadelphia. "The phone went out, and so we used cell phones," he said. "And then the Phillies brought down walkie talkies, and they fixed the phone." Cell phones... walkie talkies... What's next? "Smoke signals," La Russa quipped. He may have a sense of humor about the situation but blaming the phones seems pretty absurd. If the Cardinals used cell phones before, why not use them last night with the game on the line? Maybe La Russa is not cell-savvy but surely someone on his coaching staff - and definitely his bat boy -- knows how to send a text message. But if the old-school La Russa is wary of technology altogether, he can go primitive. Now that the Series is shifting back to Busch Stadium for Game 6, the manager can deploy the ballpark's adopted mascot as a bullpen messenger: the rally squirrel.